Hanna Liberotti, 7, walks in the parade dressed as a Christmas present as the rest of the children follow her at the Holiday Hoedown at the Gilchrist Farm in 2016. The farm will host its event Saturday and Sunday from 10-5 am. File Art. With sweaters on goats, pigs in blankets and reindeer antlers on ponies, Gilchrist Farm is ringing in the holidays with their annual Holidays at the Farm event Saturday and Sunday. “This is a total privilege to combine the joy of the holiday season with activities families can do together,” said farm owner Monica Gilchrist. 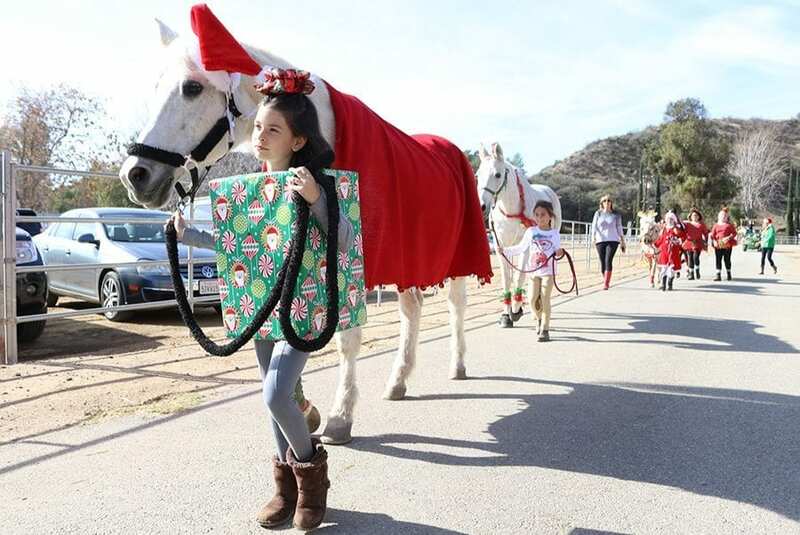 “This is our third annual.” The event kicks off with a holiday horse and rider parade at 10 a.m. Saturday. The event started as just the parade five years ago, Gilchrist said. “It started as a celebration for our riding program.” The holiday at the farm started in 2015 from the natural outgrowth from the foot traffic of the harvest festival and to extend the tradition of the parade. The farm is located near Saugus at 30116 Bouquet Canyon Road. During the event, hours of operation will be 10 a.m. to 5 p.m. “Santa comes in on the wagon,” Gilchrist said. Activities include Santa visits, pictures and letters to Santa, caroling wagon rides, live music, holiday food, a festive petting zoo, Santa’s Workshop crafts to make and take, local vendors, pony rides, horse rides, unique holiday shopping and more. There is no charge for admission or Santa visit, Gilchrist said. Activities are $5 and wristbands are $30 for children. “It’s fun to see the people who are coming back and bringing friends every year,” Gilchrist said. For more information, visit http://www.gilchristfarm.com/.